Sri Lanka’s sevens team in action. 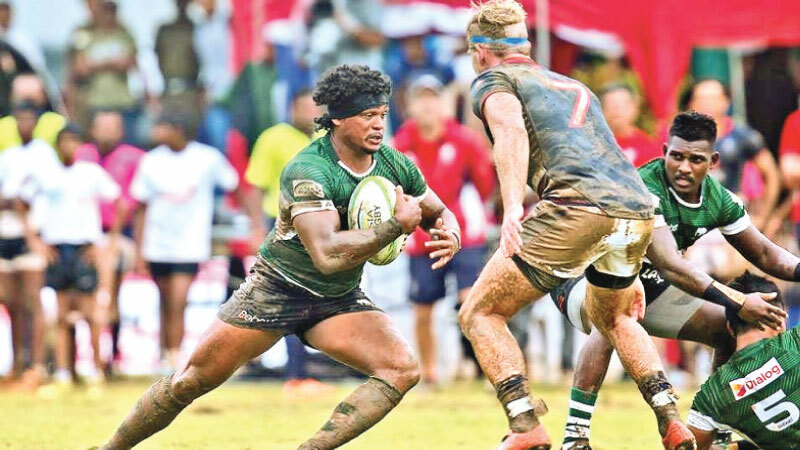 Sri Lankan Men’s Tuskers should make use of home advantage in the third and final round of the Asian Rugby Sevens Series that gets underway at the Racecourse International Stadium, Reid Avenue today. A miserable run to a disastrous sixth place out of eight teams in the second leg in South Korea, has given the side a lack of self confidence going into the third leg in Colombo. Sri Lanka has come a long way since 2016 being placed second to a hopeless fifth place so far out of the concluded two legs in Hong Kong and South Korea this year. The players are going to have no excuses in terms of being able to come out and be comfortable, where they are playing as a bunch of professional rugby players. In reality that comes with added experience, expectation as well and a bit of pressure the players put on themselves; since they are playing in front of their home crowd. There is plenty on the line for a Sri Lanka sevens rugby outfit that has exuded a relaxed and focused vibe during training for the past 10 days at the Race course. With the winner of the three-round Asian Sevens series booking a spot in the main draw at next year’s Hong Kong Sevens tournament, whether at least the men’s Tuskers will give off their very best to better the rankings will be left to be seen in their final hurdle in Colombo. Furthermore, the top two teams overall secure their place in the HSBC World Rugby Sevens Series qualifier next year and a fast start to the series this weekend is a key factor. It’s always a bonus that doing well will get you to these kinds of tournaments and playing against the top teams in Asia. High Performance Director Inthi Marikar, who was a vastly experienced coach with lots of stints and knowledge in New Zealand, came in 2016 and put things right where Sri Lanka managed to learn some lessons and put them in to play with head coach Matt Turner finishing overall second in Asia just behind number one Hong Kong. It was a lot about the training and hard work Marikar did with the Sri Lankan national sevens squad purely under him to condition the players mentally and physically to be able to handle pressure. Sometimes the players totally get it a bit wrong, but it’s about how you respond and Marikar was definitely the man to take our rugby forward internationally. But unfortunately he resigned from the post just before the concluded Asian Games in Jakarta, Indonesia. Since then things look very much jaded for the country’s national men's seven a side rugby which has fallen to the lowest sixth place out of eight teams in South Korea last month just above Chinese Taipei and Malaysia, therefore going backward almost 10 years to 2009. Going back to the main tournaments overall standings thus far, a win or a top-two finish in Sri Lanka puts Japan in the box seat to take out the overall series this weekend, but playing in Sri Lanka will be tough competition, therefore we have to wait and see whether their power pack display carried throughout the first and second legs will be enough for them to seal victory.